This beautiful water fountain adds the feature of the blue rhino and elephant. When it is plugged in, water is pumped to the top of the fountain and make the crystal running. In Feng Shui, running crystal presents to bring more good energy and running water stands for wealth coming. Besides, blue and deflect violating energy which cause robbery, accidents, office politics, biz competitors and backstabbing. This water fountain with blue rhino and elephant is one of the excellent choice for business to simulate more sale and prevent from robbery, accidents, etc. You can display it near to your cashier, or wealth corner, or where the flying star #7 locates. 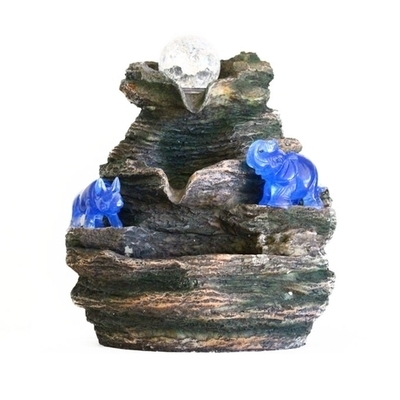 The water fountain with blue rhino and elephant is made of resin. The dimension of it is approx. 8" x 6 1/2" x 9". It is electric operated.